A few months ago, I was grateful to be chosen as the 'Motivational Mama' for the SPRING EDITION of I AM MAMA MAGAZINE. To read the full interview, scroll below. Who is Kayla Boyd, can you tell us a little about yourself? I’m a 29 year old mother of 1, I’m married to the love of my life Darius and we have a beautiful high-energized little girl Willow, who will be turning 2 in September. Outside of being a devoted and proud mummy, I run my blog 'Adored By Kayla Boyd' where I share all things adored by me as well as sharing my personal journey to help and inspire others to overcome whatever hardships you’re going through to in turn live your own, true, authentic life. You’re an inspiration and a role model to many, you practice what you preach and stand for what you believe in. Was there a pivotal moment in your life that lead you to be so self-assured and find that fierce love and belief in yourself? It’s funny that you say that because at times I view myself to be the complete opposite. I have my insecurities just like everyone else does. But what you’ve said assures me that I am on the right path and what I am projecting into the universe is aligning positively. The pivotal moment for me I would have to say, was when my marriage broke down and I left my husband. Being married to a footballer, is a struggle in itself at times and with our life being quite public there was no way of denying or hiding from what we were going through. I’m not one to hide away from things anyway because that’s not living your truth. It’s very easy to lose yourself in a relationship, especially as a young woman and I did just that - I lost myself. I lost my confidence and I no longer recognised that girl I was staring at in the mirror. My husband went into rehab and I had to pick up the pieces, I discovered a strength that was sitting beneath the surface the entire time and I realised, the only person who was going to get me through this was myself. I have always turned to self-help and holistic wellness approaches to bettering yourself, this is what ultimately led me to be able to live the life I do today. Becoming a first time mother, what changed for you? Did you lose any part of the old Kayla and what do you feel you’ve gained since becoming a mother? Darius and I made a pact that we wouldn’t allow a baby to change us or our relationship in any negative form. So I was adamant that I wouldn’t lose myself, I didn’t want to be one of those over-baring obsessive mothers. I’m a Libra so everything is about balance for me, if something is out of whack I’m in sorts ha ha, so balance was my remedy as a new mother. Many people tell you the worst, so I suppose we prepared and expected the worst. When Willow came into this world, we were like, what the heck was everyone talking about – this isn’t hard at all. Don’t get me wrong, we all have our breakdown moments but it wasn’t as difficult as what we were expecting. We were blessed with a very chilled out angel baby that was a very good sleeper, I’m sure my next child with be the polar opposite. 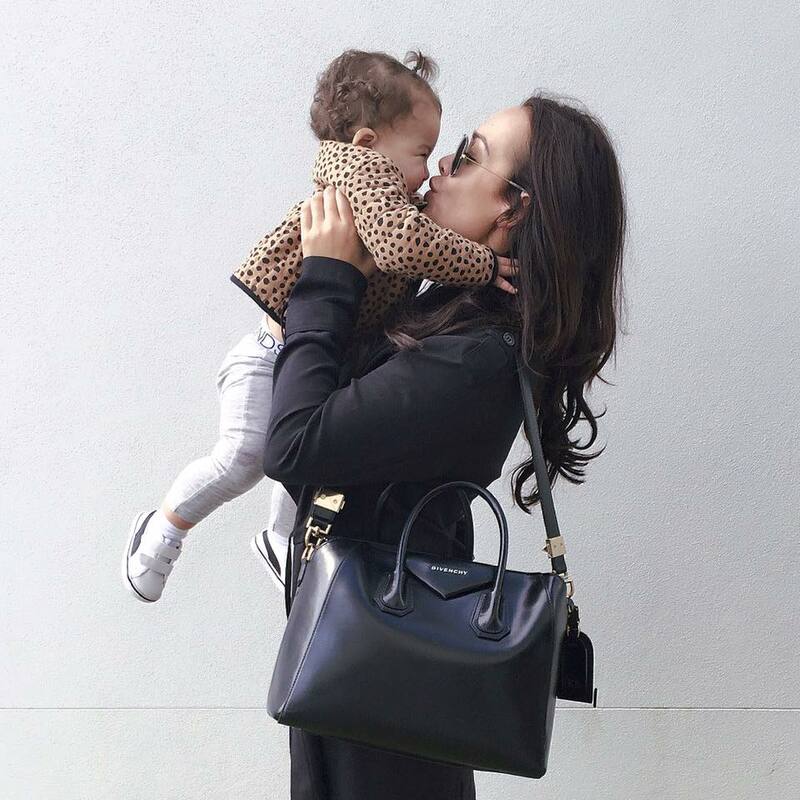 Being such a busy woman in all areas, do you ever experience mum guilt? If so, how do you overcome it? Of course, I feel as though we all experience mum guilt regardless of how busy we are. Having a baby is a shift in all aspects, it’s an unavoidable overwhelming, emotional roller-coaster more than anything. Hormones and emotions combined are going to allow any mother to feel all kinds of unwanted feelings. To overcome mum guilt, it’s all about balance. I make sure that I spend quality time with Willow and do things to encourage her development and bring happiness into her life as well as making sure that we spend time together as a family. Not all that long ago you shared something extremely personal and close to home. You suffered a miscarriage, something that was extremely painful to go through. You also shared that after your pregnancy loss, you fell pregnant again, not long after aborting the pregnancy. You experienced so much negativity and uproar for sharing this, something that obviously wasn't taken lightly. What did you hope to gain from sharing this and is there anything you’d like people to know if they are experiencing the same in silence? There is nothing worse than feeling alone in this world, I have seen first-hand with my husband how internalising your struggles can affect your mental well-being. I knew that there would be millions of other women in this world feeling the exact same way as I was having gone through similar experiences. I hoped being so open and honest would make change and dissolve the stigma around feeling ashamed of being able to make a choice, and to shed light on being able to talk about miscarriage and abortion to gain support in return. I knew there would be some negativity, but not to the extent it went to. The break-down moment for me was when I read a comment where someone told my husband and I to go and kill ourselves and to put our baby into the system, I was in total shock! As much negative uproar as there was, I did gain an abundance of support. The emails and messages from people did out-way the bad. I have no regrets in sharing what I went through, we are free to make to make a choice, it’s my body and nobody will ever tell me what to do with my vessel or how to live my life. Nobody has the right to tell anyone what to do, I don’t have the right to tell you how to live your life. I’m not ashamed for my decision, it was the right one for me and my family and in turn, I helped thousands of other women because of it and that’s where the substance lies – in helping others. Your husband Darius has shared his battle with depression publicly. What has it been like being married to someone battling depression? Did it effect your relationship or Darius’s relationship with Willow? And could you offer any advice to someone experiencing the same on how to assist or be there? There is no manual on how to be a support person to someone battling depression or any mental illness. It’s been some of the best and some of the absolute worst times in my life. It’s not just the person with the illness who struggles, it’s those around them and especially the partners. It affected our marriage, it’s basically what tore it apart. I had enough of enduring the pain that was deflected onto me, so I left, and it was the best thing I could have done because it allowed Darius to see his life for what it really was. He hit rock bottom, he quit football and he got the help and support that he needed. He spent 21 days of his life in a rehab clinic in Sydney that changed his life forever. The only way that this treatment, or any kind of treatment will help an individual is when they have accepted the will for change. If they’re forced into it and not 100% in it, then there is no amount of therapy or treatment that will work. It just won’t - we have been there! I wouldn’t be with Darius today if he wasn’t a changed man, and I am proud to say that I love the man I am with today, so much more than the man I married back on the 3rd November 2012. Willow is the biggest blessing and Darius now has a family of his own, something he hasn’t had most of his life. He is the father that he never had and still doesn’t know. He gets to set the bar and be the best daddy he can possibly be, his family is now his purpose and if he never endured this life challenge and experience, he wouldn’t have realised that. I’m proud of him and I think it’s so important for people to share the bad times because the way social media is, we all think life is one big fairytale and it’s not. Good things and the best versions of ones life comes from the most difficult measures. NEVER EVER be ashamed to talk about your struggles and always ask people if they’re doing okay, it’s always the ones that seem to have everything in control that don’t. You’re almost at your second year of motherhood milestone! At times do you ever feel like you aren’t doing enough or have those ‘I don’t know what the hell I’m doing’ Mama moments? and what has been your greatest mama moment to date? As a first time mother of 1, I feel as though I will be forever feeling the “what the hell am I doing” ha ha. As every new milestone for Willow is a new stage for me as she continues to develop and grow. I’m basically developing and growing with her. When I eventually have more babies, those wee lucky ducks will get the fine-tuned mumma Kayla version because I would have been there, done that with Willow. It’s in my nature to always want more, and to always be doing better than I was yesterday. I have so many greatest mama moments but I would have to say, the first time she was placed on my chest, the first time I looked into her eyes, her first smile and most definitely the first time she laughed. What are your dreams and aspirations for your future and the family? I have rebranded and I’m taking a new direction and shift with my brand, blog and my socials. I want to focus on working with great businesses and brands long-term and maintaining authenticity. I am currently studying my diploma in Pilates which I am so excited about, because I have a very exciting project in the works that I cannot release just yet. I have launched my event series called Unedited which is a platform where women can speak their Unedited truth. What we see in the media is edited in a way in which they want it to be perceived. I am launching the first Unedited event where I talk about my own journey in all aspects of my life and will have other women featured throughout. I am also launching a mini clothing collection in collaboration with a dear friend who owns Duke of London, a kids clothing label. We travelled to China back in April, so this project has been in the works since. With Willow turning 2, it seems more than ever that people are asking when baby number 2 is coming along, or when is it time for another. I thought I might have been ready but I am actually in no rush, I am enjoying every moment with Willow and making the most of it being just the three of us because we will never get that time back - it’s all about cherishing the present – but in saying that I am excited for the future and for our family to evolve.